Each pixel on an LCD screen consists of three subpixels: red, green, and blue (RGB), that are sitting next to each other. Most operating systems since about 2003 can improve the quality of on-screen text by using these subpixels. However, this only works if the operating system knows how the subpixels are arranged. For the majority of the monitors, the arrangement is RGB (red on the left, green in the middle, and blue on the right). However, on an occasional monitor, it is the other way around (BGR). And if you orient your monitor in portrait mode, the subpixel layout can be V-RGB (vertical RGB) or V-BGR. Observe the colored square below from close by, e.g. 20 cm or 8 inch. On one of the red-cyan borders, a thin black line should be visible. This black line indicates your subpixel layout. Alternatively, you can look at the line patterns. The pattern that corresponds to your subpixel layout will appear more black, sharp, and smooth (without jagged edges) than the other patterns. If you find that your screen is not RGB, you may want to verify that your operating system handles subpixel rendering correctly for your display. If you wear glasses, you need to pay attention that your glasses do not separate the colors. This is especially an issue at higher strengths (3 diopters or more). Take off your glasses if you are myopic and the glasses have a negative strength, or look through the center of the lens with one eye while closing the other eye. Below you can see text rendered with various smoothing techniques. The text that is rendered with your subpixel type should appear most black, smooth, and sharp. For comparison, the same text is rendered by your browser below the sample image. Whether you like subpixel rendering is a matter of taste, and its effectivity depends on the font. However, if you do choose to use subpixel rendering, it should be optimized for your monitor's subpixel layout. 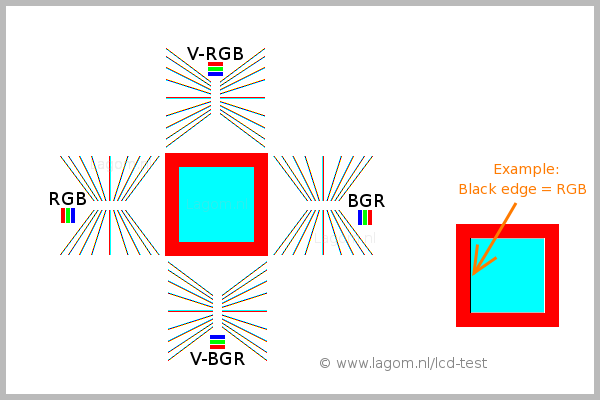 Check your LCD monitor at Lagom.nl! If you believe your operating system does not handle subpixel rendering correctly, or if you prefer a non-subpixel text smoothing, you can try to adjust the settings, depending on which operating system you use. Subpixel rendering is called ClearType. right-click on the desktop > Properties > Appearance > Effects > Smooth edges of screen fonts > Standard/ClearType. The default in Windows is the RGB-layout. For BGR-layout, you need to run additional software that is available from the Microsoft website: ClearType Tuner. Windows does not support V-RGB or V-BGR subpixel layouts (for example if your screen is in portrait mode). Subpixel rendering is not available for Windows 2000. System Preferences > Appearance > Font smoothing > light/medium/strong. The "standard" setting does not use subpixel rendering. Preferences > Appearance > Fonts > Details. Select "Subpixel smoothing", Medium or Slight hinting, and the subpixel order (RGB, BGR, VRGB, VBGR) of choice. Control center > Display > Theme > Fonts > Configure anti-aliasing. Select the hinting level (slight or medium recommended) and the subpixel order (RGB, BGR, etc. ).